Data center migration plans are high on the list of key projects for CIOs, IT managers and other managers involved in corporate projects. These are among the riskiest and most complex undertakings for an enterprise. Migrating company applications from one location to another, or from one platform to another, can represent a great risk for an organization. Still, many companies undergo the arduous process with the expectation of significantly increasing efficiency and business agility. Why Is Data Center Migration Inevitable? For many enterprises, data center migration is part of a corporate IT cost-reduction initiative. Obsolete legacy hardware or software platforms no longer supported by vendors eventually require migration to a more modern infrastructure. Mergers and acquisitions usually result in consolidation of multiple data centers to eliminate redundancy, and thereby maximize the cost efficiencies expected by combining companies. Also, more companies are seeking to take advantage of private and public cloud platforms. These challenges create a number of "unknowns" that may derail the migration plan and result in unplanned and unacceptable business downtime and possible security risks. Furthermore, failing to mitigate these challenges can cause major delays and increase project costs. Planning and executing enterprise data center migration or consolidation cannot be done manually as most enterprise networks are simply too large and too complex, plus sufficient documentation is often lacking. Thus, the right set of tools is essential. 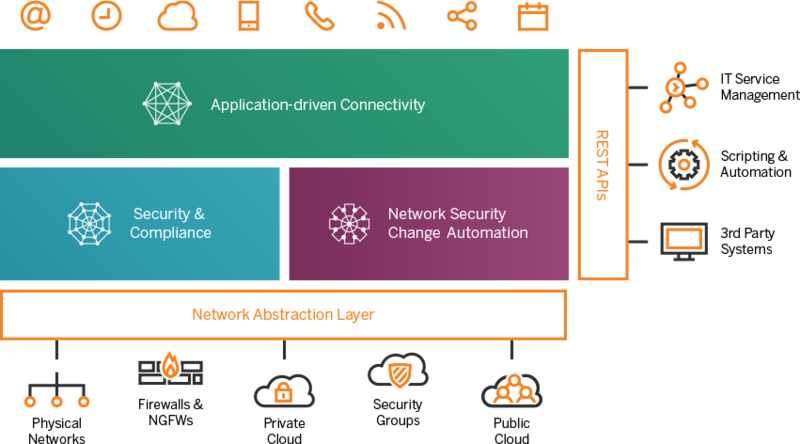 Tufin Orchestration Suite overcomes these challenges by managing security policies during the migration project and providing the ability to automatically discover application-connectivity dependencies to maintain business uptime. Tufin streamlines data center migration for minimal business disruption and maximum security control. Tufin Orchestration Suite accelerates and simplifies every phase of the project: planning, migrating, validating and post-project maintenance and enhancements.